It's time for Instagram Travel Thursday where we share the joy of travel through Instagram photos. I noticed something about my Instagram photos this week. 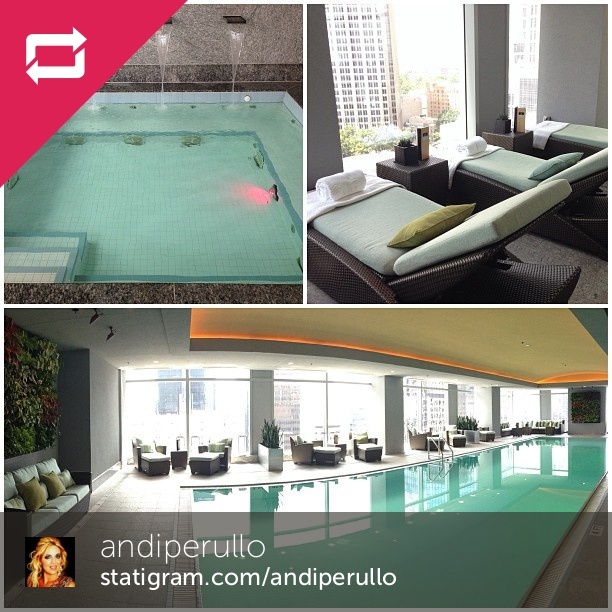 Apparently, my followers like luxury hotel pools. Do you? My pool shots have been my most popular photos on Instagram to date. Perhaps it is because it's hot outside right now, and when you see beautiful blue water in your feed, you just want to transport yourself there. I would love to be here right now. 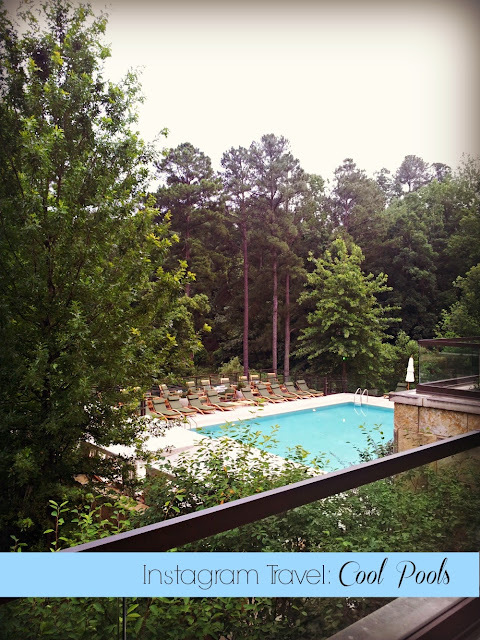 The Umstead Hotel and Spa in Cary, North Carolina, a Leading Hotel of the World, has a beautiful pool. When you are in this hotel, you feel as if you have been transported to a serene island, surrounded by nature. I think I could spend weeks here, and it's just 15 minutes from my home. I was at the Umstead Hotel and Spa on Monday to see the newly renovated spa. I'll tell you all about that soon, but as I left, I snapped this photo. It has become my most popular photo on Instagram to date. 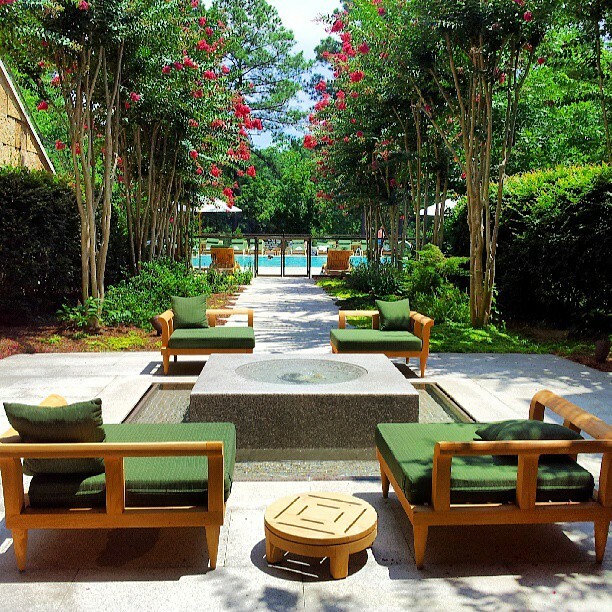 But, I will go ahead and share today that if you are local area spa guest at the Umstead on Monday through Thursday, then you will have all-day access to this beautiful outdoor pool, if spa service equal $100 or more. A manicure and a pedicure in one day would do that for you, Ladies! I also spent some time at the pool while I was in Williamsburg, Virginia last week. 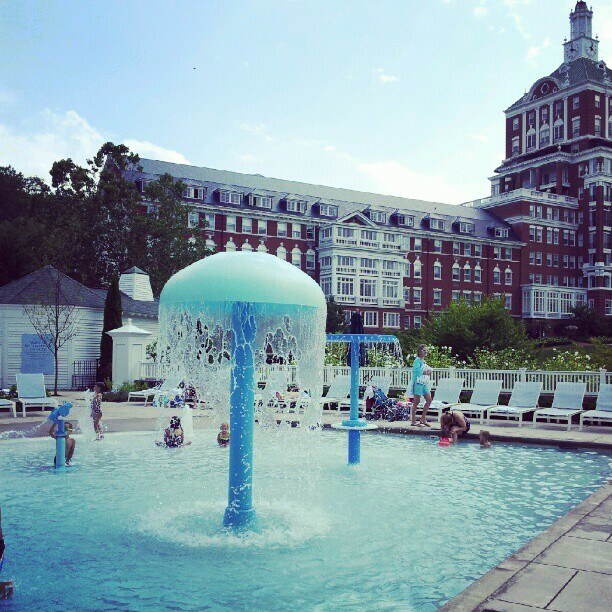 I took two photos of the pool area used by Williamsburg Inn and Williamsburg Lodge guests. We were staying in the Lodge. These two pools are used by both hotels. One pool is for the noisy guests. That's where I had to be because I had noisy little people with me. 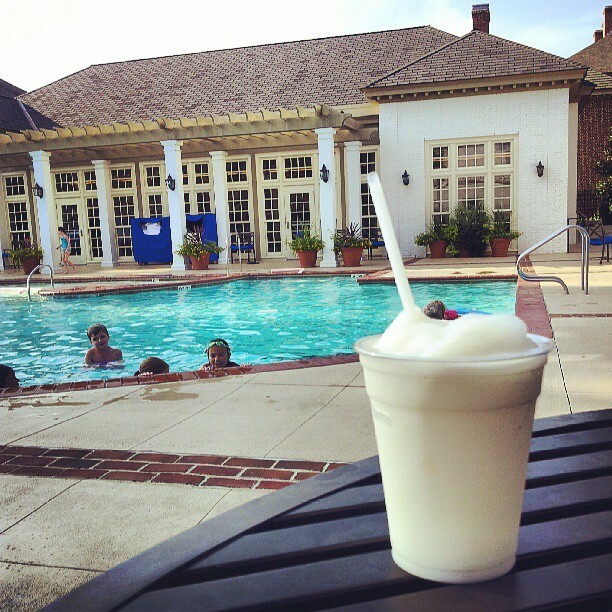 They swam while I enjoyed this pina colada. 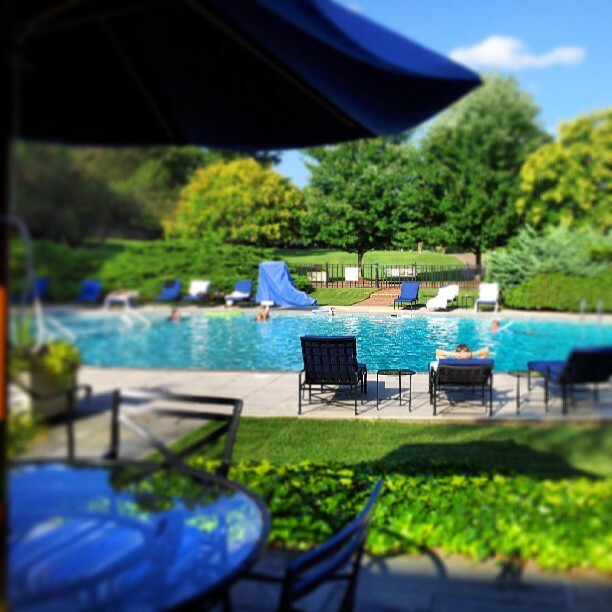 The other pool is called the quiet pool, and it is used more by the Williamsburg Inn guests because that hotel caters more to couples rather than families with young children. The Williamsburg Lodge, which will soon be my next "Pack Your Bags" feature, has a more casual, lux feel, suited for families. A bar and food area separates the two pools. One of my all-time favorite cool pools is at the Old Edwards Inn and Spa in Highlands, North Carolina. This summer, they debuted a new family pool on property, but it was not complete when I visited in April for my "Pack Your Bags" feature on the Inn. I think this pool is gorgeous. There is something to adding a bit of nature in the landscape. It makes you feel tranquil and cool. The Inn has just announced that it is hosting a three-day wellness retreat in September, called Ignite your Life. You can learn more about this wonderful spa-wellness travel special on the Old Edward's Inn and spa website. I had just started using Instagram when I visited the Omni Homestead Resort in Hot Springs, Virginia for my "Pack Your Bags" feature last year. This pool is a now a family favorite. The resort also has a lazy river and water slide on the other side of this family wading pool. I look forward to returning here because it's a great place to relax. My son still talks about his wonderful experience at the Homestead. I think it is majestic to sit at the pool and have mountains as the backdrop. In this photo, the hotel is quite impressive, too. The thing I love about Instagram is that it can connect you with travelers who have similar interests, or personal taste. I have a fondness for these ladies on Instagram, and they've been to some really cool pools in the past month, too. 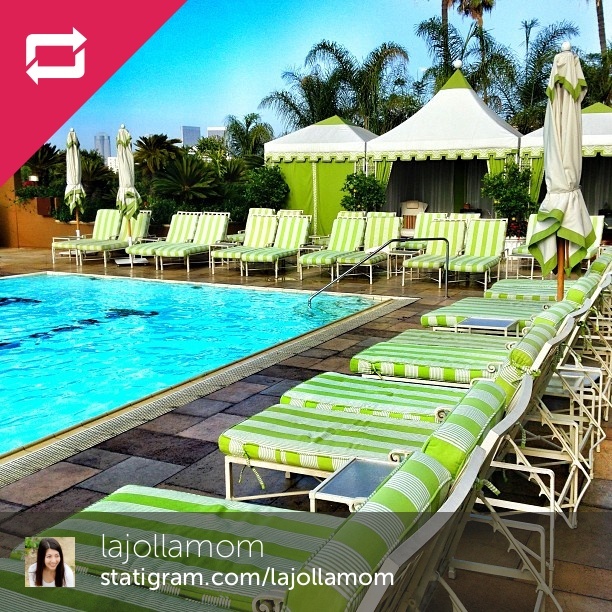 I love the green and white chairs at the Four Seasons Los Angeles. @JajollaMom recently had a wonderful weekend get-away here. She has my dream job, and writes for the Four Seasons blog so she sees lots of beautiful pools. I've had the pleasure of being at the Ritz-Carlton Charlotte pool, but @AndiPerullo, a fellow North Carolina Travel Blogger, captured it beautifully in these shots recently. This pool is so cool, and it's on the 18th floor of the hotel. Andi loves luxury hotels just like me. I think we have good taste. 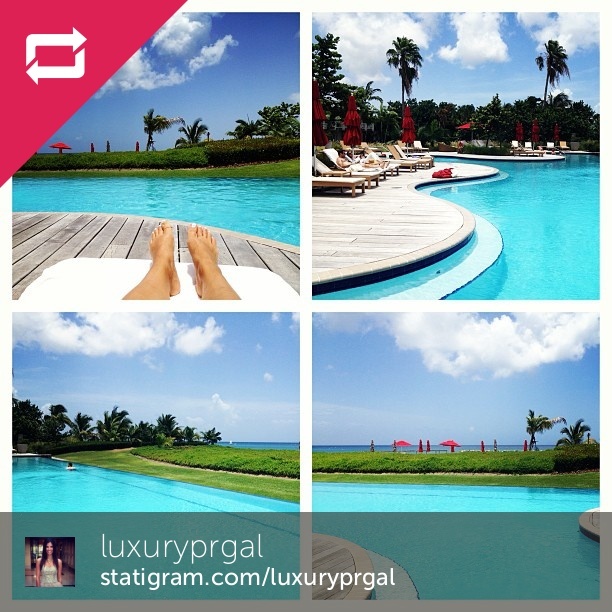 Christine Kirk, @Luxuryprgal, had me swooning when I viewed all of her Four Seasons Nevis photos this week. This hotel is definitely on my bucket list. 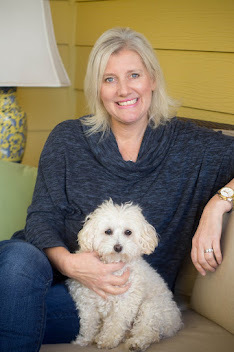 Christine is the founder of #Luxchat on Twitter, and through her company, Social Muse, a social media and PR company for luxury travel, restaurant, tech, and lifestyle brands, she's always at some of the best resorts in the world. 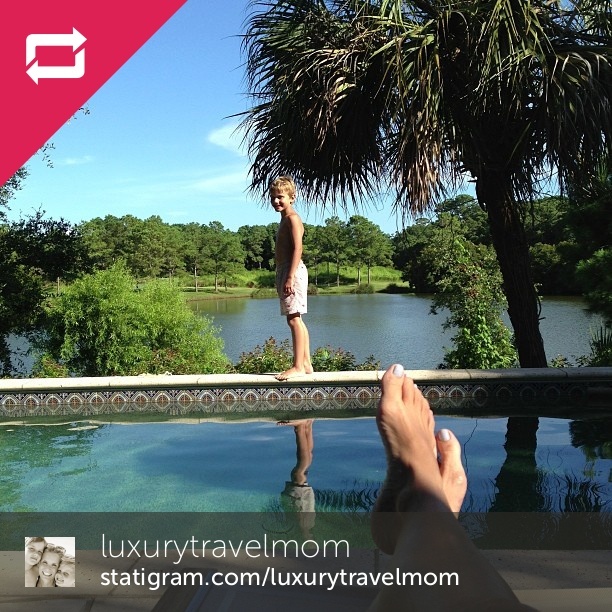 And my own #IGTravelThursday co-host, Kim-Marie Evans, @LuxuryTravelMom, has a sweet pool at her new summer home in Kiawah near Charleston, South Carolina. She says there are gators in the water behind her pool. Guess she better protect those well-manicured toes. Kim and I share a fondness for good hotels, too. We hope to show up at one at the same time one day. And if you are a blogger, please join us in the link-up. Take a look at the official rules on Skimbaco Lifestyle, but here are some important things to remember when linking your post. Link to a new Instagram travel post and use the permalink of your post, not the homepage URL. 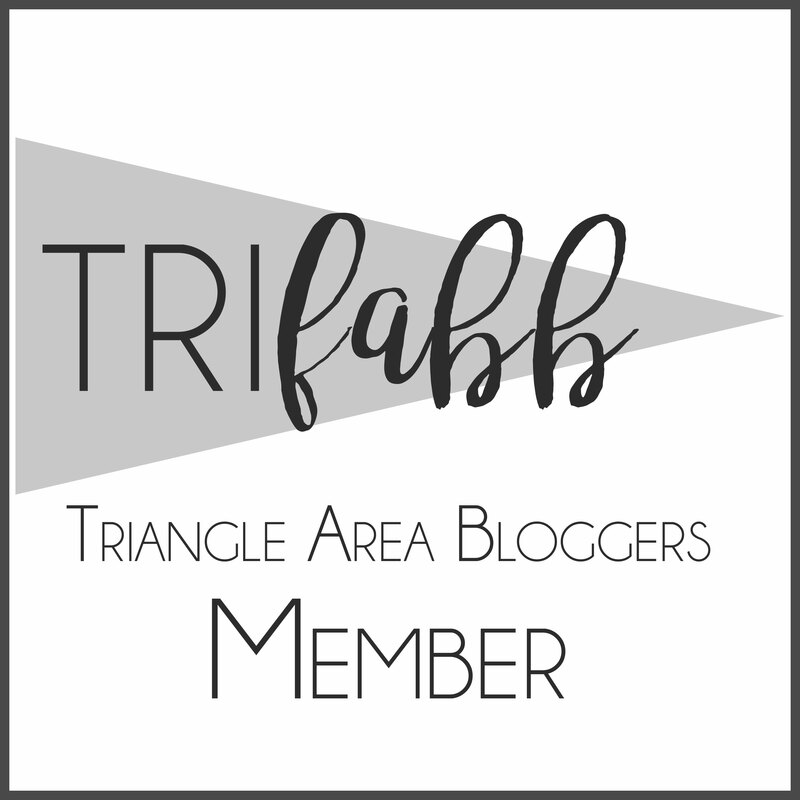 Only new posts from the week of the linky and no giveaways, other linkys or sales pitches. No links to your Instagram profile, only links to your blog. Link back to one of the Instagram Travel Thursday hosts. Visit a few other posts in the linky and show them some love (comment, tweet, Pin etc.). Links that do not follow the guidelines will be removed. 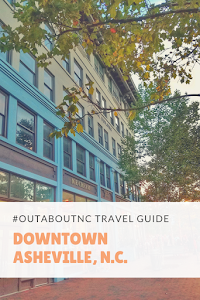 The Instagram Travel Thursday linky is posted on Thursdays at 1AM EST and the linky is open until the following Wednesday. Be sure to follow me on one or more of my social media platforms. Twitter, Instagram ,Facebook, Pinterest, Google Plus or on Bloglovin, if you just want post updates. When traveling, I'm on Instagram the most. My personal family Instagram account is LeighPHines.